We are in Austria, visiting the Cistercian Abbey of Marienkron, home of the contemplative daughters of Saints Robert, Alberic, Stephen and Bernard. We expected to find contemplative nuns retired from the world and absorbed in prayers and penances to repair for the sins of men, so numerous in these days. 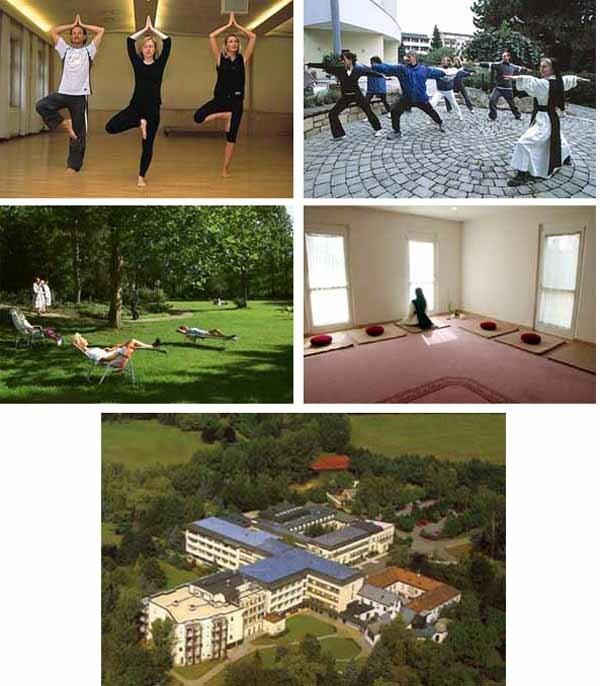 Instead, those 19 nuns, in tune with the adaptation to the world preached by Vatican II, decided to transform their Abbey into a center of fitness, beauty, Yoga exercises and Tibet meditation. rating sixth from the top on the Austrian sauna center list. So, here are the Cistercian nuns, above, giving a hot shower to a pleased 50-year-old man; massaging a naked 30-year-old woman, below first row; teaching Tibet and Yoga exercises, second row; supervising the relaxation of guests or in Zen mediation, third row. In the last row, an aerial view of the abbey. These are some fruits of Vatican II. By the fruits you know the tree.